We’re pleased to announce that the first shipment of donated HANS™ PowerPacks and Solar BriefCases arrived in Puerto Rico after a 10-day voyage from Houston to the town of Mayaguez. Although new power lines were installed in Mayaguez after Hurricane Maria destroyed the grid, utility service is irregular and communities still experience outages 2-3 days a week. Unreliable electricity inconveniences everyone, but it creates particular hardship for those suffering from illnesses. The non-profit Somebody Cares Puerto Rico received the units and delivered them to families caring for loved ones with serious health issues. 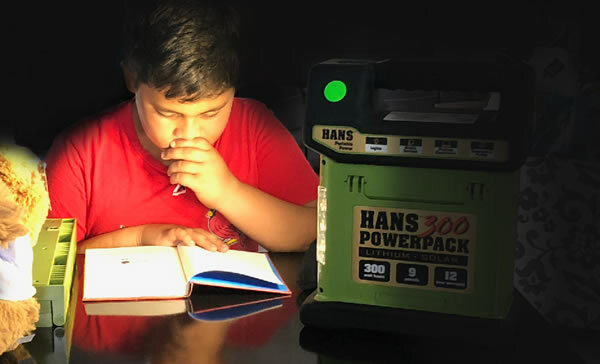 Based on reports we’ve received, the HANS™ PowerPacks gave these families peace of mind knowing they have a source of light when providing necessary care. They can also keep their cell phones charged to call for emergency help when needed. One recipient of the HANS™ units is Rosa, the primary caregiver for Daisy who has advanced multiple sclerosis and must be on a respirator. Rosa expressed gratitude for the dependable light and recharging capability of the unit. 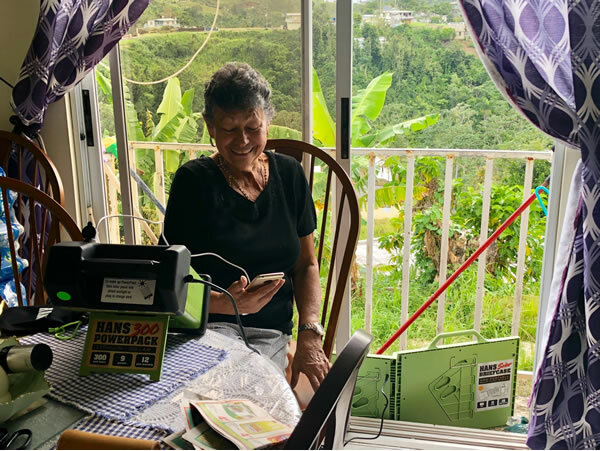 Hurricane Maria was a harrowing experience for Benita and her husband: Their windows and doors were blown in, water poured into their house, their carport and part of their roof blew away, and they were stranded at the top of a treacherous hill and could not evacuate until neighbors banded together with machetes to clear the road. To make matters worse, Benita’s husband has a severe respiratory illness and needs oxygen. Although they’ve recently returned to their rebuilt home, they still face problems with power outages. 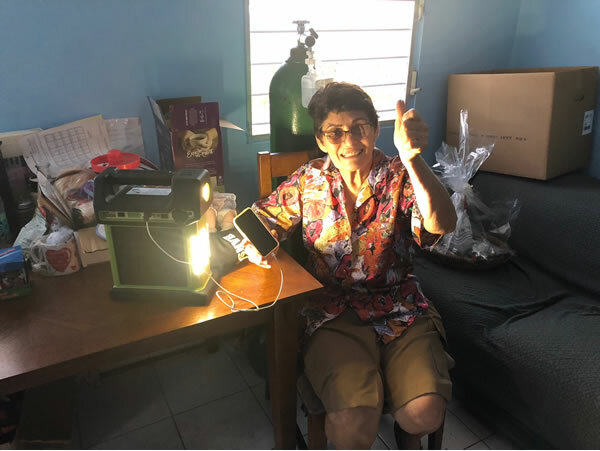 Benita loves that the HANS™ PowerPack offers reliable light and can keep her phone charged in case she requires help from neighbors or medical providers. Sixth-grader Juan enjoys reading and math and recently placed 4th in a math competition for all of Puerto Rico. His family received the HANS™ devices because his older brother suffers from a rare disease that requires 24/7 care. Other units are being placed with families in similar circumstances and all recipients are truly grateful for the generosity of those who have made donations to the Energize-Mobilize: Puerto Rico campaign. It’s not too late to get involved! You can donate a HANS™ PowerPack 300 or make a monetary contribution of any amount by visiting the Billions in Change Foundation. Remember that for every donated HANS™ PowerPack 300, Stage 2 will donate a matching HANS™ Solar BriefCase 60. Further, once we reach our goal of 100 donated HANS™ PowerPacks, Stage 2 will donate an additional 100 HANS™ PowerPack 300 and 100 HANS™ Solar BriefCase 60 units. The Energize-Mobilize: Puerto Rico campaign officially ends on July 31 and we’d love to hit that milestone! Thank you for your support and for spreading the word.